Andy Coules has a play around with this compact device, which acts as both a Dante-enabled digital-to-analogue converter and a professional four-channel headphone amp. 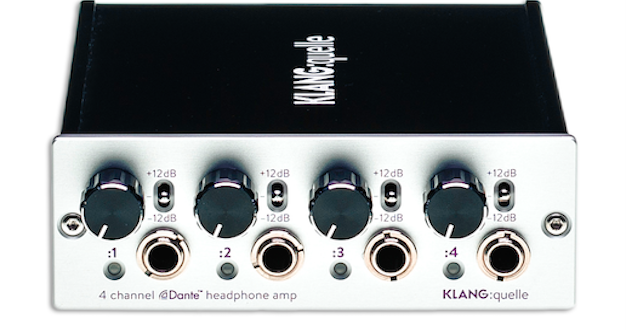 Having been let loose on the excellent KLANG: fabrik 3D in-ear monitoring system I was intrigued to be given the opportunity to try out the KLANG: quelle four-channel Dante-driven headphone amplifier. As its title suggests it fulfils the dual roles of digital to analogue conversion and headphone amplification for four independent stereo signals delivered via Dante. 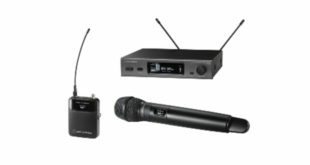 It comes in two versions, compact and 19in rack; the two versions are identical but for the fact that the 19in version fits in a rack and has four XLR pairs for balanced stereo output of the four channels. For this review I took the compact version for a spin. And compact it is – the front panel is 1U high and just 12cm wide (or 4.7in) meaning you could easily fit three of them in a standard 19in rack slot – not that it has any rack mounting options, it’s designed to be used for ‘drop box’-like distribution. 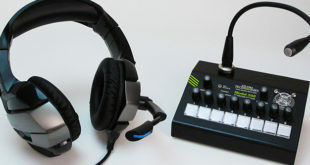 The front panel sports four each of volume controls, gain range switches (-12/0/+12dB), 6.3mm TRS female jack output sockets and a signal LED. On the back is a single locking RJ45 EtherCON connector and a 24V DC power input socket. It can also run via power over Ethernet (PoE) and there are two LEDs on the back panel to let you know which powering method is in use. The whole thing is very solidly built and feels rugged in the hand. Existing Dante users should be familiar with the requirements but if you’re new to digital audio networking you’re going to need a gigabit switch free of non-audio network traffic and a networked laptop running the free Dante Controller software in order to set it up. 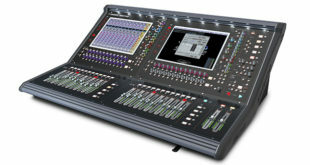 You will also, of course, require an audio source, be it a Dante-enabled digital mixing console or a laptop running the Dante virtual sound card. For the purpose of this review I used a laptop running Cubase to supply the audio across my home network. In Dante Controller, the first thing I did was made sure the sample rates on the two devices matched (quelle can handle anything up to 192kHz) and I was quickly rewarded with a green tick that confirmed the connection was established. It’s important to note that once the connection is established it will remain so without the need to run the Dante Controller software again, even if the transmitters and receivers have been turned off and on again. Thanks to the Dante virtual sound card Cubase soon saw eight new outputs, which I grouped into four stereo outputs so that I could start sending audio to them. It was then a very simple matter to piece together multiple output mixes so I could have a listen. Even at the lowest sample rates the audio was crisp, clear and had a warmth that I didn’t expect from digital audio; it sounded equally great on my studio headphones as well as via moulded IEMs. The output impedance is less than 1 ohm so it is ideally suited to low resistance in-ear headphones. I powered the review unit via PoE and I noticed that it got quite hot in general use, so decent ventilation will need to be taken into account if you plan to mount it in any kind of portable unit. Once the connection is made and the audio is flying across the network basic usage is simplicity itself, a fact borne out by the manual, which is just six pages long yet contains all you need to know. The volume knobs feel solid to the touch and make setting a suitable level very straightforward, and the gain range switches enable you to cope with a wide range of input signals and tailor the output level to a wide range of devices. The only minor niggle I had with the user interface was that the knobs are quite large and in very close proximity to the gain range selection switches, which meant I found it very difficult to change the gain range without knocking one of the knobs. This is likely to be an issue for any but the daintiest fingered so you might want to think about selecting your gain range before setting the level. 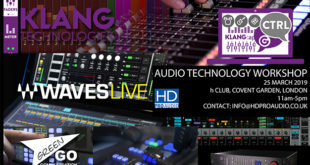 KLANG: quelle is an excellent addition to an existing KLANG 3D monitoring system, but it works well as a stand alone unit for simple, efficient and high quality headphone distribution on the live stage, in rehearsal or in the recording studio.